It is with heavy hearts that we announce the passing of a cherished mother, wife, sister, aunt, daughter-in-law, Teena Roshelle Janet Brookings (nee Compton). 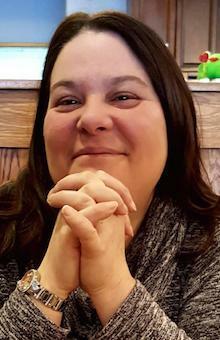 Born February 27th, 1973, Teena said her final goodbyes in the HSC ICU, August 11th, 2018. Leaving to mourn her are her husband Eric, son Luke, mother Yvonne Compton, father Murdoch Compton, sisters Sherry (John) Goodland and Cara (Justin) Clark, and her brother Darren (Debbie) Compton, as well as her special father-in-law Eric Brookings Sr. and many nieces, nephews and cousins. Teena's battle began in March of this year with cancer. She fought a strong fight against cancer which in the end she succumbed too. She showed great courage and perseverance through this long battle. Teena loved to socialize with family and friends and was an avid animal lover. She lived life to the fullest, and she made every moment count. A special thank you to all the nurses and doctors at St Claire’s and the Health Sciences Centre who provided Teena with the utmost care and made her life as comfortable as possible in this time of need. Resting at Barrett’s Funeral Home, 328 Hamilton Avenue with visitations on Monday, August 13, 2018 from 7pm-9pm and Tuesday, August 14 from 2pm-4pm & 7pm-9pm. Funeral service to be held from Barrett’s Chapel on Wednesday, August 15 at 11am. Interment to follow at Holy Sepulchre Cemetery. As an expression of sympathy, flowers are gratefully accepted or donations in Teena’s memory may be made to the SPCA or the Dr. H. Bliss Murphy Cancer Care Foundation. To view online guestbook or leave a message of condolence, please visit www.barretts.ca.